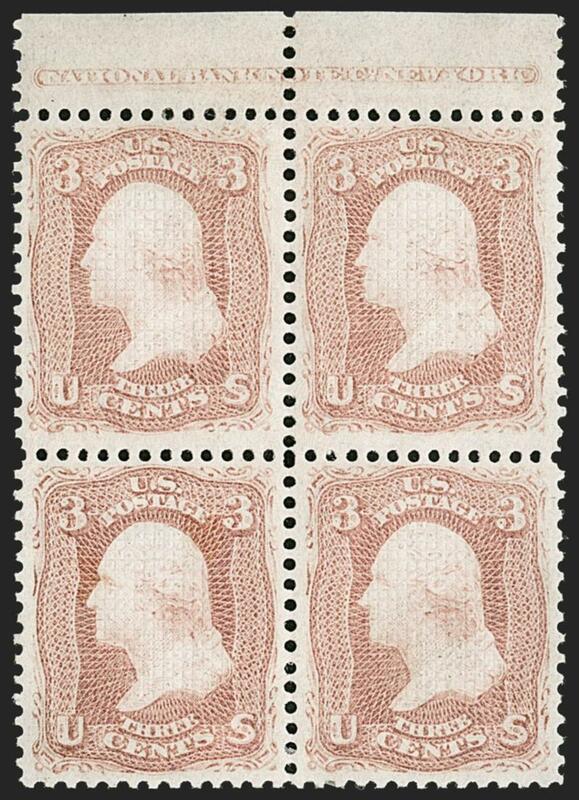 $55,000.00 for a block of four with gum; catalogue notes "Values for No. 79 are for Fine-Very Fine examples with minor perf faults"
The August 1867 3¢ experimental A Grill was the first grilled issue, using a machine patented by Charles F. Steel. It was soon learned that the all-over female grill weakened the paper and interfered with perforating and separating, resulting in rough perforations and pieces torn out of the margins when split apart. 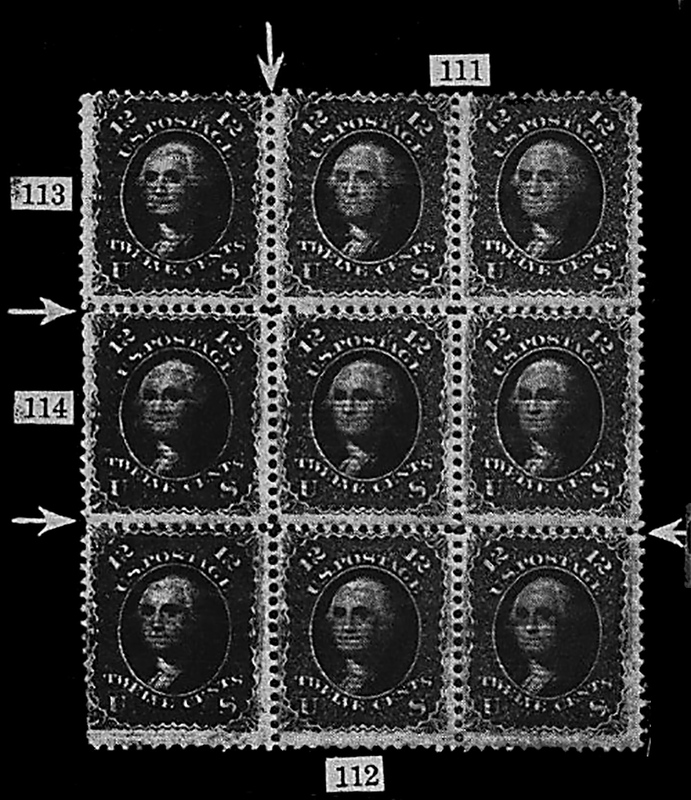 Within two months of A Grill production the apparatus was modified by dividing the embossed area into small rectangular units within each stamp (C Grill). Eventually the female A/C grill device was replaced by male grilling rollers that had grills sized well within the dimensions of the stamp. 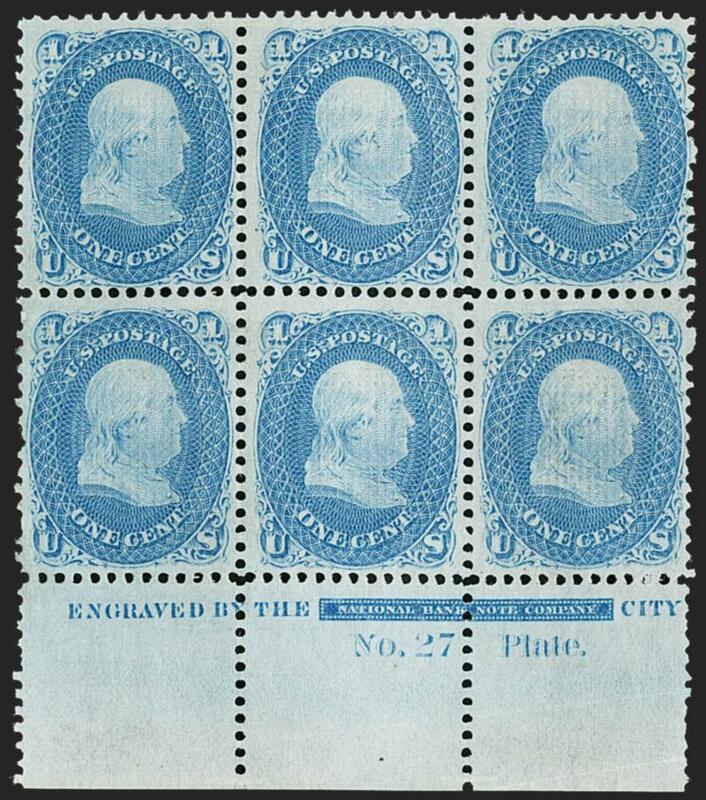 All stamps produced during the regular grilling period, starting January 1, 1868, were grilled on the machines using the male rollers. 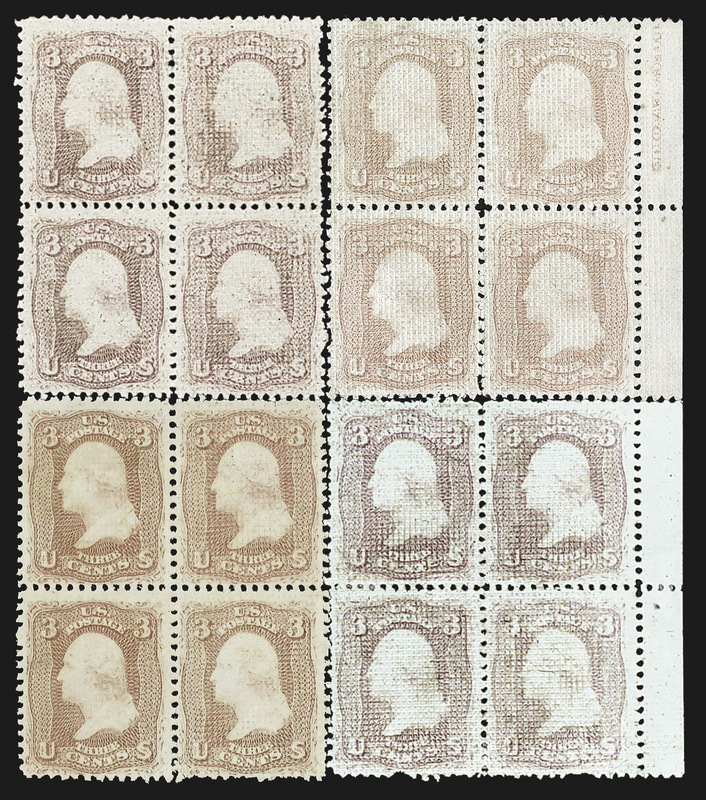 Multiples of Scott 79 are extremely rare. This block was part of a block of 20 described as a new find in an article by Philip H. Ward, Jr., published in Mekeel's 11/15/1948. Ward wrote, "The new find which was located in New York City consisted of a block of twenty, five horizontal by four vertical... 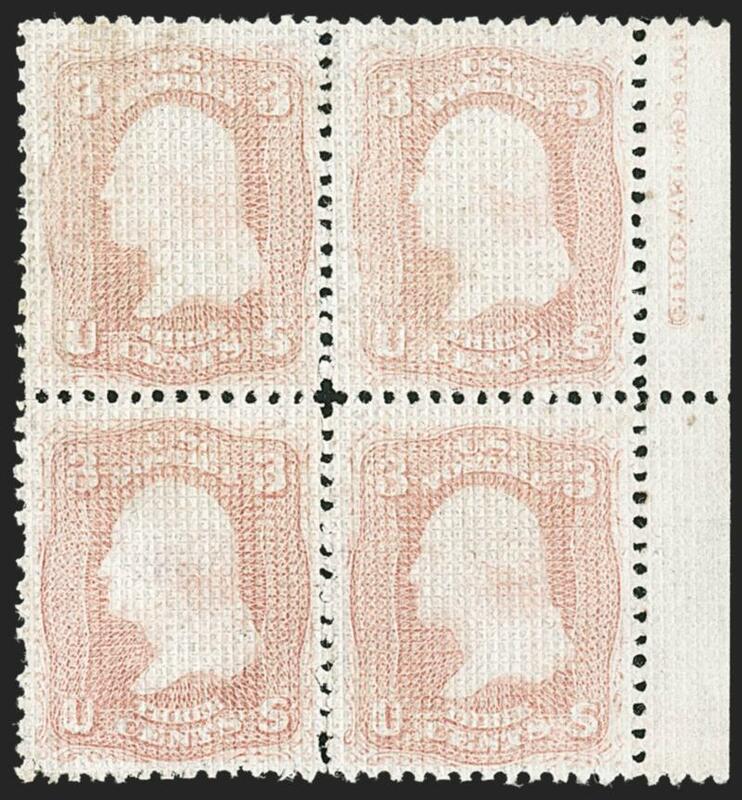 There is a right sheet margin with part of imprint on margin of upper stamp. Until this large block was located, possibly two and certainly not more than three blocks were known. Fortunately, the new block is very well centered and fresh, although is without gum. 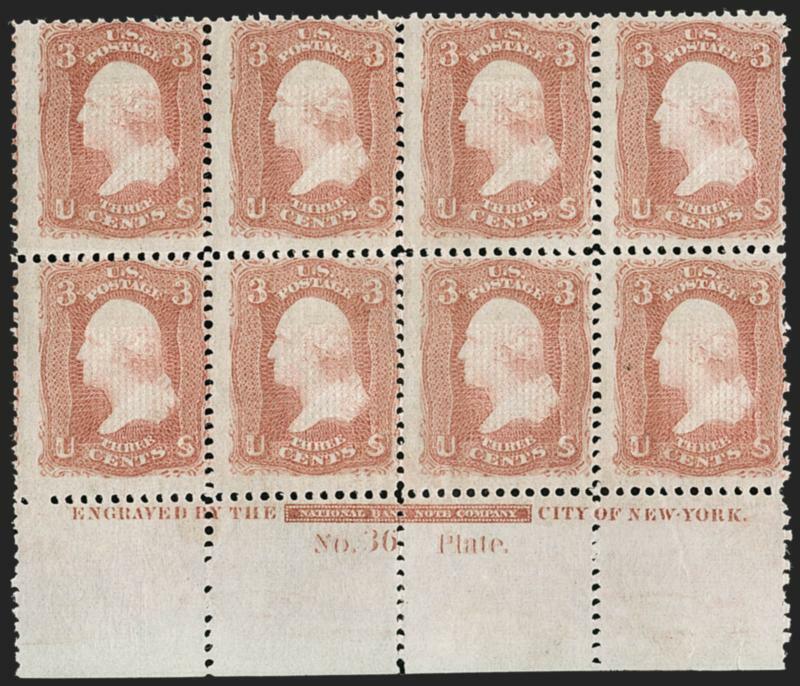 The piece has been broken into four blocks of four and four singles.... We are pleased to announce that one block goes into our collection as it was one of about half dozen of known blocks of main varieties missing in our own collection." A digital reconstruction of four blocks is shown below--at least one block has been broken up. 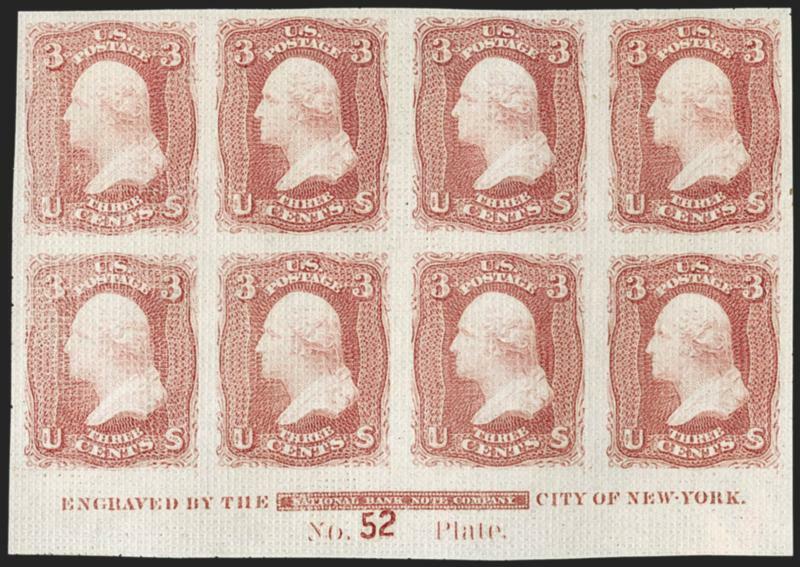 Multiples of the 3¢ C Grill, Scott 83, are extremely rare. This block has a notation indicating the possibility it was owned or handled by John K. Tiffany, which would date its discovery to sometime prior to his death in 1897. Its earliest auction appearance was in the 1956 Caspary sale, where it sold to the Weills, on behalf of their closely-guarded client, Benjamin D. Phillips. After the Weills purchased the Phillips collection in 1968 for $4.07 million, they sold the block to another major client, Stephen D. Bechtel, whose notation "Weill March '70" appears on the accompanying Philatelic Foundation certificate issued to Raymond H. Weill Co. on October 6, 1969. When the Bechtel collection was sold privately in 1993, the block was purchased by Robert Zoellner. Mr. Gross acquired it in the Zoellner sale held by our firm in 1998. The Z Grill is significant in the study of grill production for several reasons. First, the grill itself is unlike all other grills used on United States stamps. The top of each pyramidal point in a grill has a ridge that runs across the grill point. Some collectors call this the "rooftop." Only on the Z Grill is the rooftop line horizontal--all others have either an X-shaped point or a vertical ridge. The Z and E Grills are the same size, but the distinctive horizontal ridge on each Z Grill point is its identifying feature. The Z Grill was labelled "Z" because William L. Stevenson, who classified the grills in the early part of the 20th century, could not place this type in the scheme of grill production. Today, much of the Z Grill's history still remains a mystery. There are no contemporary grill-production logs, and philatelic classification (Z, D, E) was never applied to Stamp Agent delivery records, so those dates and figures do not establish beginning and ending dates for the different types of grills. Educated guesswork, based on earliest recorded uses, Stamp Agent records, relative scarcity and observations made of the material itself, is the only way to answer questions about grill production. The Z Grill was the first grill put into regular production after the experiments with the A and C Grills. We know the Z Grill was an early creation, because it is found on essays and experimental papers from 1867. When grilling entered the contract phase on January 1, 1868, it most certainly was Charles F. Steel--the grill's inventor and the National Bank Note Company employee responsible for grilling--who chose the Z as the grill for the job. The Z Grill probably went into production during the first week of January 1868 and was used exclusively until the D Grill machine was added to the process two weeks later. Soon after, the Z and D grilling rollers were replaced with the E and F grills. Based on the earliest documented use of the 12¢ Z Grill (2/12/1868), E Grill (3/3/1868), and F Grill (5/27/1868), our theory is that the first 12¢ sheets were grilled in January 1868, using the Z Grill machine. They probably come from less than a day's production, which coincided with high-volume 2¢ and 3¢ grilling, and with the few sheets of 1¢, 10¢ and 15¢ stamps put through the Z Grill machine. 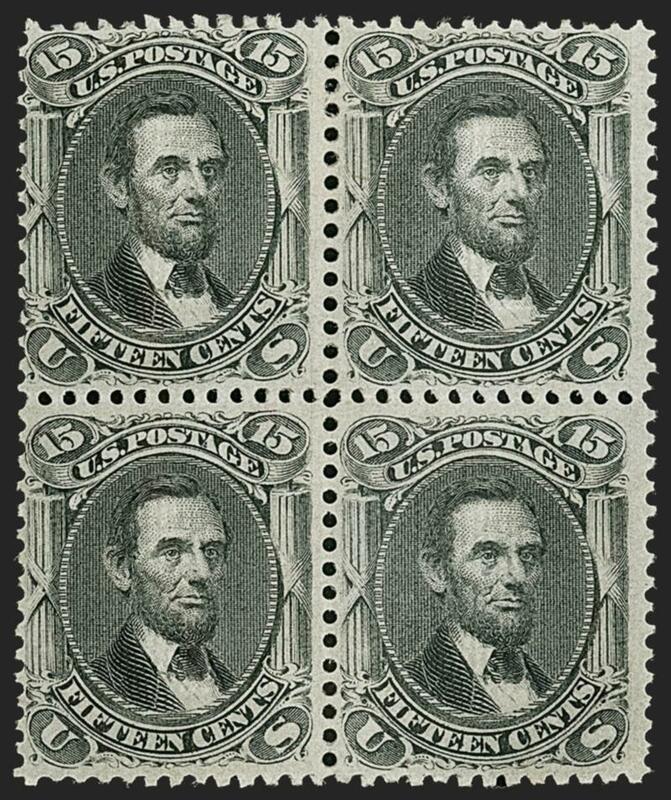 The 12¢ stamps were finished with perforations and distributed in time to be used no later than February 12, 1868. All of the 12¢ Z Grill stamps are a consistent shade of Intense Black. 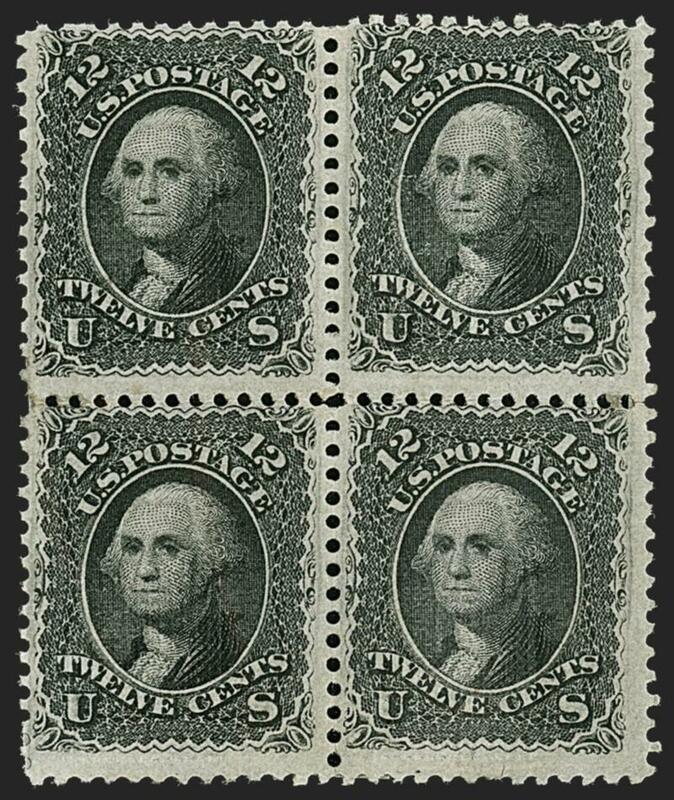 Additional 12¢ stamps were produced in late February, after one of the two grilling machines was refitted with the E Grill roller. These were available by March 3, 1868 (EDU). 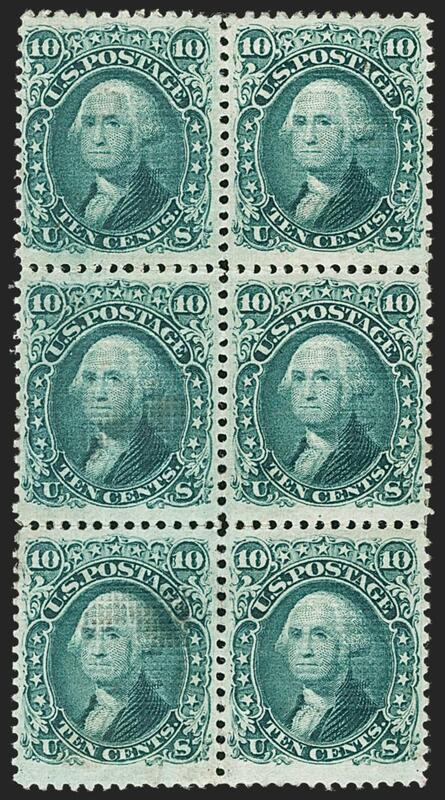 No more 12¢ stamps were grilled until May, when the second machine was refitted with the F Grill roller. 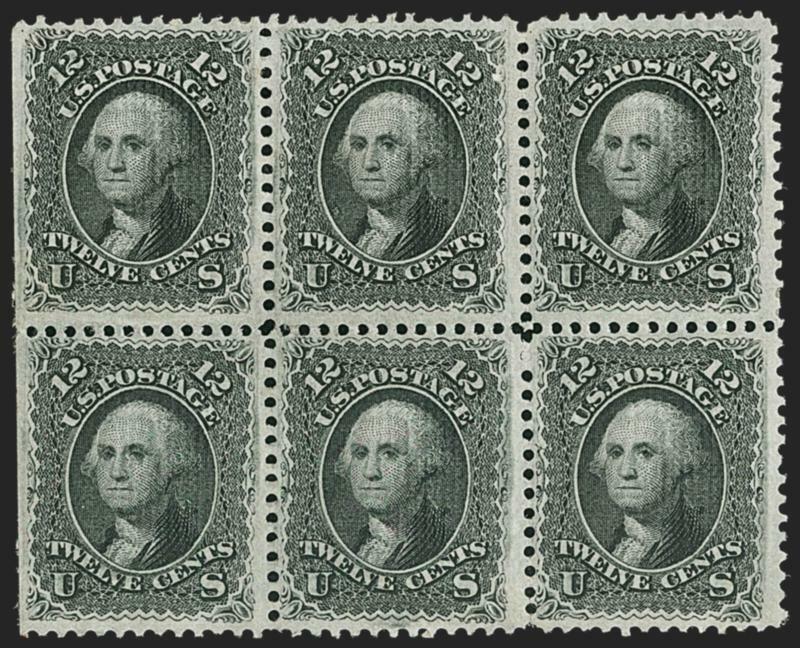 These 12¢ F Grill stamps were available by May 27, 1868 (EDU).